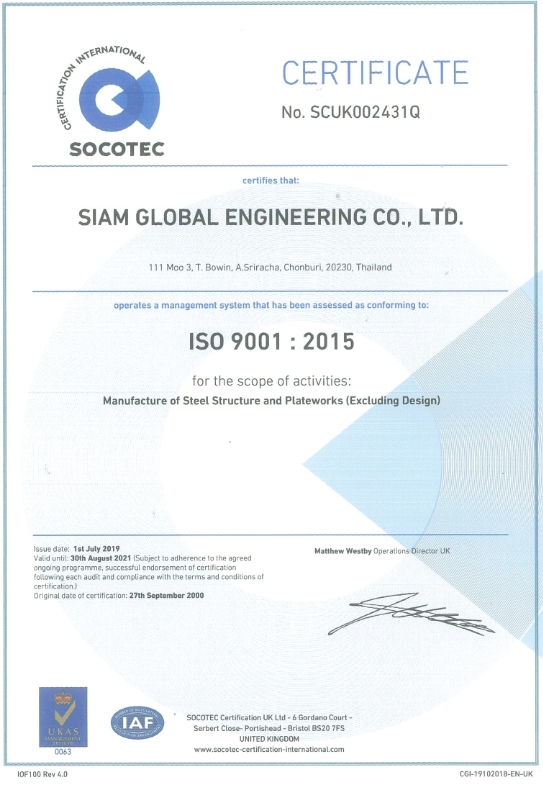 Siam Global Engineering Co, Ltd. is registered as a quality endorsed company with AJA Registrars Ltd. Our quality system and procedures are accredited across to ISO 9001:2008, Certificate No: AJA00/2627. Independent third party audits are conducted across our system and structured internal audits are performed to ensure ongoing compliance and continuous improvement to our systems and procedures. A specific quality plan is developed for each of our projects and covers all aspects of administration and management, work methods, document control, inspection and test and compliance check sheets. Our Quality System and instructions are subject to continual review and all users are able to submit change proposals to the System Manager who distributes such requests to other users for review/comment/approval prior to any subsequent implementation.